After director, Stuart Gordon made the cult hit “The Re-Animator” he reteamed with actor Jeffrey Combs for another movie based on an H.P. Lovecraft story called “From Beyond”. This sci-fi horror film is right up there with “Re-Animator”. This movie is creepy weird and fun to watch. Combs plays physicist Crawford Tillinghast who along with Dr. Edward Pretorius create a machine called the Resonator. When turned on it creates a distinct frequency that stimulates the Pineal gland in the brain, allowing a person to see an alternate dimension of reality. It’s explained as a kind of sixth sense. What they see and experience is not all that pleasant as Dr. Pretorius is consumed by the machine and presumed dead. Crawford is hauled of the looney bin only to be released into the custody of psychologist Dr. Katherine McMichales. Back at the lab which is located at 666 Benevolent St. Crawford shows off the Resonator to Katherine who becomes obsessed with it. When the Resonator is turned on they are introduced to the new Dr. Pretorius, he is hideously mutated and completely insane. His pineal gland juts out from his forehead like an antenna. 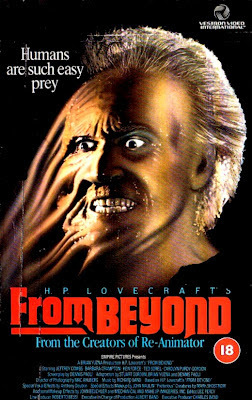 The special effects are pretty dated and the creature makeup is pretty well done, but campy at times. The overall story is quite bizarre but still engaging and entertaining. For comic relief we have Bubba Brownlee, an ex-football player turned cop, played wonderfully by Ken Foree. Our three protagonists fight for survival against the Resonator and the evil Dr. Pretorius. This movie is a quick 86 minutes, just enough to keep the story moving at a decent pace.